Africa is well well known for its wild scutellata bees (African killer bee ) They are very dangerous bees and if you disturb them in their nest they swarm out and attack you. I had a couple in my garden hedge a while back and moving past with my lawn mower upset them. I soon had a whole bunch of them flying around my head so I switched off the mower and went inside until they had gone away. Fortunately I was not stung and the bees left the hedge after a couple of days. If you happen to be allergic to their sting it could be fatal for you. The African killer bee was imported into the USA and has become a big problem in California. They often swarm and move to new places. They are very aggressive and apparently attack and kill the local bees. Here in SA it is a common sight to see a swarm of bees coming your way. Thousands and thousands of them all flying in your direction. Some beekeepers catch the queen if they can and place them in hives on their farms. A while back my elderly mother had a swarm arrive in her garden and take refuge in a tree. To get rid of them before they made a nest she turned a hose on them causing some of them to leave. While the queen bee is around they will not budge. She eventually sprayed them with an insecticide and killed thousands of them. Very brave or very stupid for a eighty two year old granny with a gammy leg. Once they move in it costs a fortune to have them removed by a professional. Certain beekeepers have been experimenting with the killer bee here in SA and have developed a very docile bee which apparently gives 33% more honey than the wild variety. It's a tame variety of the African killer bee. The bee is so tame that you can take the lid off the hive and watch the queen bee laying eggs. You cannot do that with the normal bee. For me a bee is a bee and it has a sharp point at one end that means extreme pain. I just stay away from them. Beekeepers use bees in various ways. Many of them have hives which they hire out to fruit farmers to assist with the pollination of their apple crops. This is very hard work as the beekeeper has to move his bees into an area and out in a short time (normally at night). Moving hundreds of hives is no joke especially at short notice. If apple farmers detect a fungus or something on their crops they spray and if the bees get in the way its their problem. 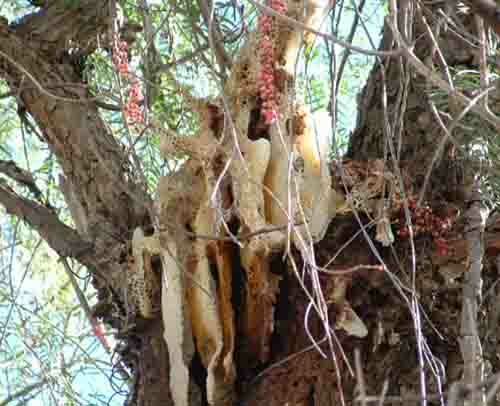 The honey produced by these bees can also contain a residue of the insecticides used in the orchards. Hiring out bees is not their only income. Some beekeepers also farm with the honey and wax products produced by the bees. One beekeeper in Cape Town has two hundred colonies of bees which he places in different locations around the city . By doing this he is able to take advantage of the different types of vegetation in different areas. For instance if you have many bluegum trees you end up with a honey tasting of Eucalyptus. This farmer produces 20 different flavours of honey. Here is a description of two more varieties. Mountain flower honey comes from wild flowers (wild geranium and buchu) that grow in and around Simonstown. The honey is amber coloured and has a musky flavour. Another honey is the fynbos variety. This honey is coloured dark red to black and has a bitter spicy flavour. Some people like it, others don't. The darker the honey the more minerals it contains. Its easy to go out and buy honey but does anyone know that its a dangerous job getting the honey into the jar. There are many ways of approaching bees. Certain people dress up in protective clothing, others don't bother. To get to the honey you have to open the hive and move the bees out of the way. As smoke drugs the bees it is used to pacify them while the beekeeper is working in the hive. You won't catch me doing this even if the bees are drugged. Beekeeping in SA is big business. The industry is said to generate a hundred million Rand per annum. Thats a lot of bees, a lot of honey, and plensch money. When you visit our country do not forget to try the honey.